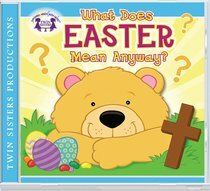 Teach and celebrate the REAL meaning of Easter with this collection of Bible and Scripture songs. Recorded by kids, for kids, these songs will be used for the Easter holiday and beyond. Bonus! Print the PDF lyrics of these favorite songs from your home computer. About "What Does Easter Mean Anyway"